« Did Mitt Romney really say he was too important to go to Vietnam? This entry was posted on August 24, 2012 at 2:37 pm and is filed under Ethics-general, hypocrisy, Lying, Politics. You can follow any responses to this entry through the RSS 2.0 feed. You can leave a response, or trackback from your own site. Yup. Part and parcel of the whole sequence, from “Romney is a felon” to “Romney is a tax cheat,”, and now this, which is arguably worse than either. Good call. Thanks. 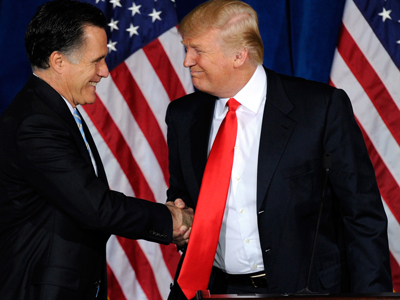 By the way, I don’t know anybody who said Romney was a felon. Stephanie Cutter said that his SEC filing said he was CEO of Bain post-1999, and either he was telling the truth to the SEC then or he was committing a felony by a false filing: nasty language but not quite an accusation. I disagree. That comment could easily be made by someone with a sense of humor that can laugh at life’s ironies, whether those ironies align for or against us. This is more in line with the character of Romney that I have witnessed thus far.